Yes — flying can give you a toothache. You may be surprised to find that your teeth become sensitive and develop a growing pain as your plane leaves the tarmac and begins to climb. Not only will oral problems you brought on the plane with become much worse, but you may notice some tooth pain for the first time. So what exactly is going on? And is there any way you can manage this type of pain? Flying can cause toothaches because your body experiences a pressure change with an increase in altitude, a condition known as aerodontalgia. You may notice a pain in your ears or get a headache for the same reason. However, you should only encounter pain in problem teeth; the changes in pressure throughout a flight shouldn’t affect your healthy teeth. Also note that though flying may bring your attention to a new issue or make pre-existing pain worse, it doesn’t have an effect on your tooth health. Flying doesn’t make issues such as cavities, loose fillings, and gingivitis worse. You may also experience toothaches on a plane because of sinus pressure. If the discomfort you experience while flying is across all your upper back teeth, it’s likely a problem related to the sinus nerves near your jaw rather than an individual tooth problem. It’s difficult to address tooth pain in the middle of a flight if you don’t come prepared. Follow these tips to help manage your pain before and during a flight. Have you been struggling with some tooth pain? If so, try to see a dentist before your flight. The altitude changes will exacerbate any problems you’ve been dealing with. A dentist can curb these issues, whether you need to have a cavity filled or a new mouth guard made. Moreover, he or she can give you some advice for managing your pain while flying. Ask your dentist about painkillers if you’ll be flying soon after an appointment, and take such medications roughly a half-hour before your plane is in the air. It’s also worth checking in with a dentist if you have a history of tooth problems. Cracks, cavities, and issues with fillings can develop before you experience any pain, but they will lead to some discomfort while flying. If you came prepared with your dentist-approved pain meds, remember to take them before you leave and to take more when you can during your flight. Also note that your teeth will still be extra sensitive during this time. Avoid cold beverages and foods, and go for water instead of coffee, tea, and other acidic or sugary drinks. If you’re still recovering from dental surgery, bring extra gauze to handle any additional bleeding from your gums that may occur during the flight. Recent dental work: You should be fine to fly even if you’ve recently had dental work, including surgeries, done. However, if your teeth are still feeling sensitive, you may struggle with some discomfort while flying. Consult with your dentist about your flight before departing if possible. Fillings: Older fillings and fillings that need to be refilled are causes for concern during a flight. Air can enter the space between the tooth and the filling. If the pressure changes faster than that air can equalize, then the air in the tooth will expand and cause some pain. Cracked teeth: Similar to the problem with fillings, cracks are especially vulnerable to pressure-related pain. Air can enter these small spaces and then expand as you change altitude, causing some discomfort during your flight. Early tooth decay: Your teeth may have felt fine on the ground, but if you’ve got tooth decay that you haven’t noticed, flying may lead to some new pains. Already-sensitive teeth: There are several causes of sensitive teeth, including poor dietary habits (e.g., drinking too many acidic beverages) and a receding gum line. 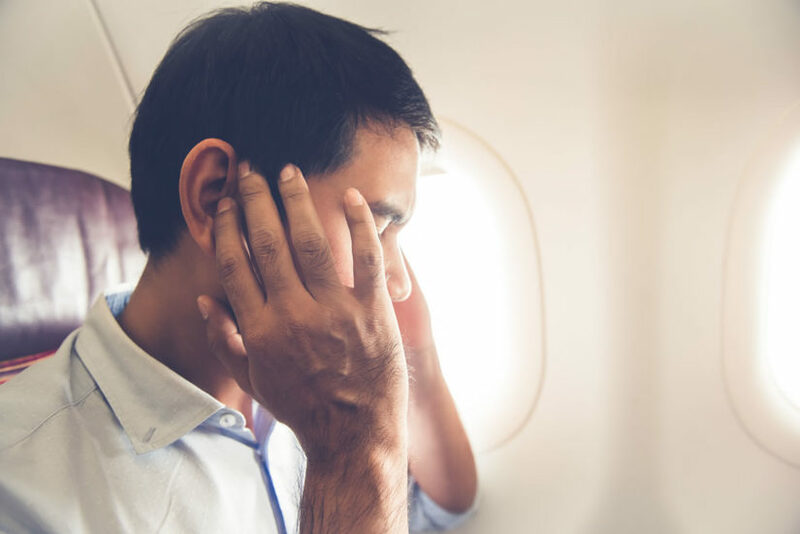 If you’re struggling with these problems before you get on a plane, you can expect an increase in tooth pain and sensitivity during your flight. It’s worth checking in with your dentist if you experience any pain in your teeth while flying — even if the pain disappears once you land. This is because healthy teeth shouldn’t become sensitive because of altitude changes. A dentist can check for early signs of tooth decay and correct whatever caused your sensitivity before it gets worse. Finally, make an emergency dental appointment if you’ve recently undergone surgery and notice swelling, redness, or an unpleasant taste in your mouth after traveling. These are all signs of infection.